The Western Australian Mounted Infantry or known by its common acronym, the “WAMI”. 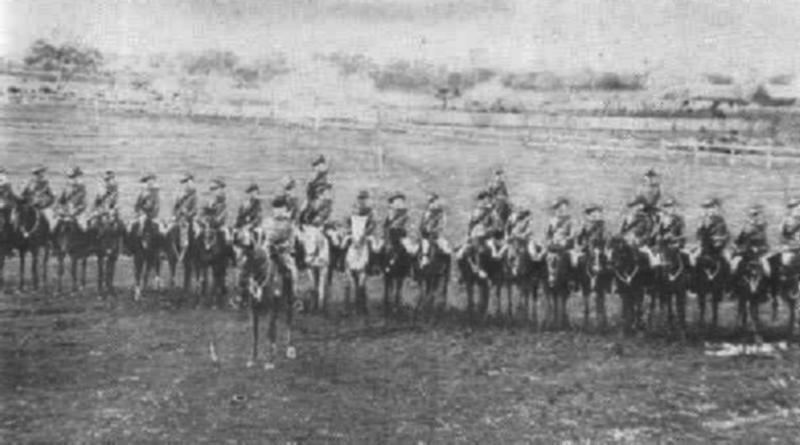 The Regiment was raised on 7 June 1900 as a consolidated mounted formation incorporating the volunteer cavalry units scattered around the southern region of the state of Western Australia. Into the fold came the Bunbury Rifle Volunteers, Mounted Infantry Section which itself was only formed on 20 January 1900 as the mounted section for the Bunbury Rifle Volunteers. This squadron sized formation drew on Troops located at Bunbury, Harvey, Donnybrook and Brunswick Junction. Another squadron came from the Pinjarra Mounted Infantry. Pinjarra had a long tradition of mounted units although none survived. The Pinjarra Mounted Infantry began on 1 March 1900 while the third squadron came from the Geraldton Mounted Infantry which was formed on 1 April 1900. A fourth squadron was created after June 1900 based around the Perth metropolitan area. After the Commonwealth reorganisation of 1903, the Regiment was renamed to the 18th Australian Light Horse Regiment but still retained the Western Australian Mounted Infantry territorial title within its name. Similarly with the introduction of universal training in 1912, the reorganisation of that year brought with is a name change to 25th Australian Light Horse Regiment but again, the Regiment retained the Western Australian Mounted Infantry territorial title. During the Great War, the WAMI formed the basis for recruiting the AIF Western Australian Regiment, the 10th Light Horse Regiment. This formation served in Egypt, Gallipoli, the Sinai, Palestine and Syria. On return of the Regiment in 1919, it was decided to retain this name in the Militia Regiment and so another name change occurred and henceforth the 25th was known as the 10th (WAMI) Light Horse Regiment, a name it has retained through all different permutations of this unit until the current day. This section explores the evolution of the Regiment from its first origins as a Commonwealth formation. Each year maps the movement of men and often locations of the various Squadrons and Troops. To get the flavour of the Regiment, it is best to begin the journey at 1900 and follow though each year till the end. "A" (Bunbury Rifle Volunteers, Mounted Infantry Section) Squadron, 1900. "A" (Bunbury Rifle Volunteers, Mounted Infantry Section) Squadron,Bunbury - Busselton- Donnybrook - Karridale - Brunswick Junction. "B" (Pinjarra Mounted Infantry) Squadron, Pinjarra - Harvey- Cannington.